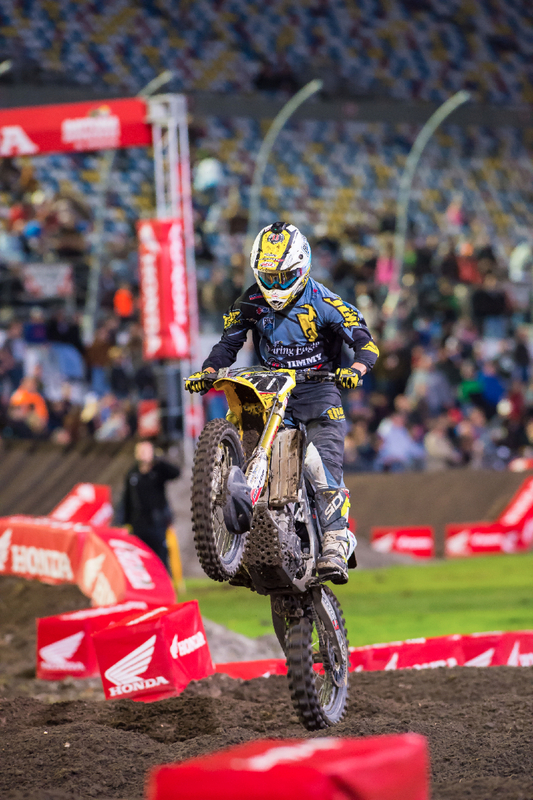 DAYTONA BEACH, Fla. (March 8, 2015) – While there may have been a little hitch in their collective giddy-up heading into the main event, there was plenty of pep in the RCH Soaring Eagle/Jimmy Johns/Suzuki Factory Racing team’s step when the checkered flag flew in Saturday night’s Daytona Supercross by Honda at Daytona International Speedway. 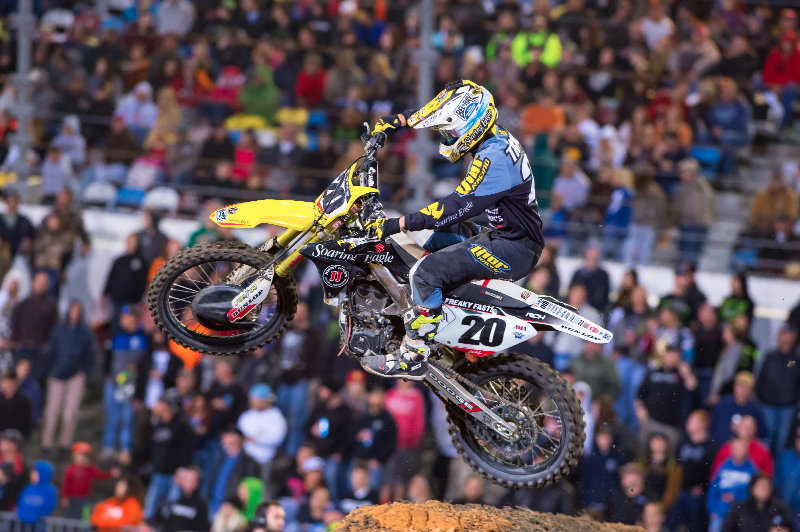 With his RCH stablemate Ken Roczen sidelined for the night after re-injuring his ankle in the day’s first practice session, it was up to Broc Tickle to carry the torch for RCH in Daytona and he did exactly that. Despite getting together with Trey Canard in the first corner and essentially starting dead last, Tickle rallied for an admirable 10th-place finish. 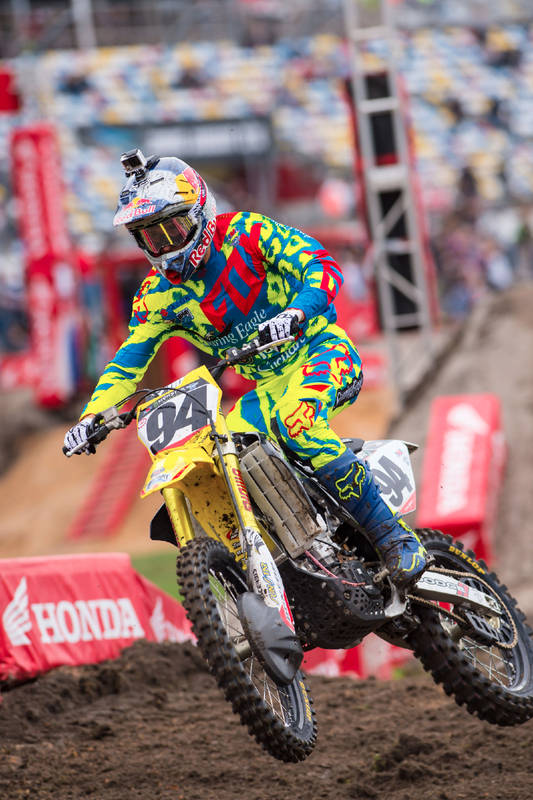 Rewind to earlier in the day, where Roczen had just posted the fastest time of the of weekend’s opening 450SX practice. A lap later, the 20-year-old German caught his left foot on a tuff block and re-injured the same ankle he hurt two races ago in Atlanta. Following the incident, the team made the difficult decision to sit Roczen for the night. The top-10 effort allowed Tickle to close the points deficit between him and ninth-place Andrew Short to just two points. Roczen slipped from third to fourth in the standings. Monster Energy Supercross, an FIM World Championship, kicks off three consecutive stops in the heart of the Midwest beginning next weekend when the series visits Lucas Oil Stadium in Indianapolis. Round 11 of the 2015 Supercross Championship will be televised live on Fox Sports 2 Saturday, March 14 beginning at 7 p.m. Eastern Daylight Time, 4 p.m. Pacific.